The volcanic moon that orbits Jupiter known as Io routinely undergoes a unique phenomenon that scientists at NASA have dubbed remarkable. The atmosphere of the moon actually expands and collapses each day as it orbits Jupiter. NASA says that Io is the "most volcanically active object in the solar system." The moon is constantly erupting sulfur dioxide gas plumes that rise up to 300 miles above Io's surface. That all builds up a thin layer of atmosphere for the moon as it makes its way around Jupiter. 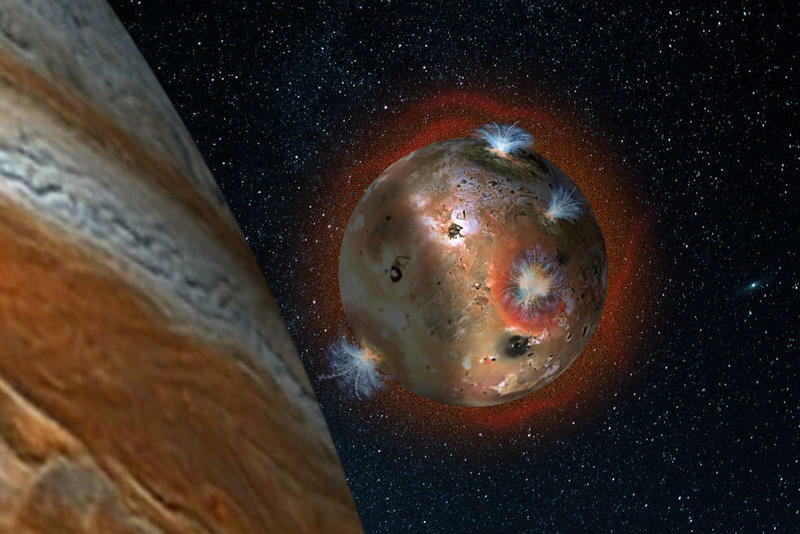 Once every Io day (1.7 Earth days) for two hours, though, the moon is eclipsed by Jupiter's massive shadow. That sends temperatures plunging to -270 degrees Fahrenheit. The thin atmosphere condenses into ice and collapses. Once the moon returns to full sunlight, the surface warms again. John Spencer, co-author of this study at the Southwest Research Institute, offered this. "This confirms that Io's atmosphere is in a constant state of collapse and repair, and shows that a large fraction of the atmosphere is supported by sublimation of SO2 ice…Though Io's hyperactive volcanoes are the ultimate source of the SO2, sunlight controls the atmospheric pressure on a daily basis by controlling the temperature of the ice on the surface. We've long suspected this, but can finally watch it happen." At the risk of minimizing the awesomeness on display here, this sounds pretty neat.